Grow your own DIY leather jacket in a petri dish #DIY « Adafruit Industries – Makers, hackers, artists, designers and engineers! Via Good Magazine. Thanks to Will for the blog tip! Lee first began experimenting with different forms of vegan leather a decade earlier, when she and Scottish biologist David Hepworth would create “living materials” in their respective homes. 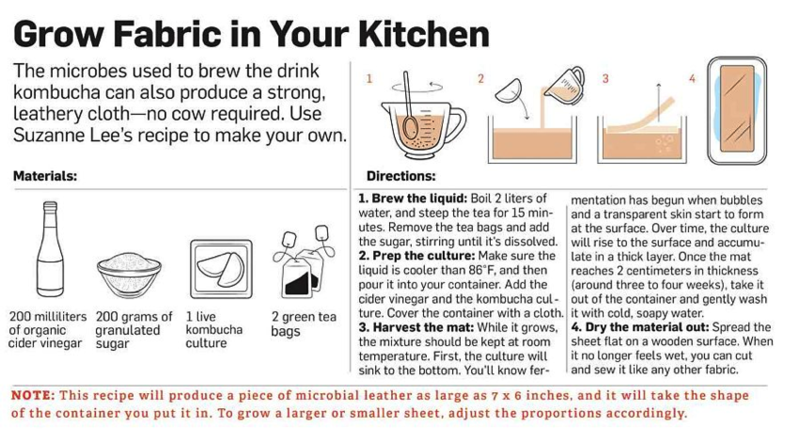 By combining tea, sugar, and a similar bacterial/yeast combination frequently used to ferment kombucha, Lee and Hepworth discovered that microbes, after ingesting sugar, create organic fibers that bind into pliable strips of cellulose. Eerily, when molded into the form of a garment and left overnight to dry, the pieces fuse together together without any visible seams. Check out the full post including the recipe for making your own cow-free “leather” at home!